Starting with version 5.0.7.9 and above of AD Bulk Users you can set a users manager value using the managers username, distinguishedName or the managers employeeID. 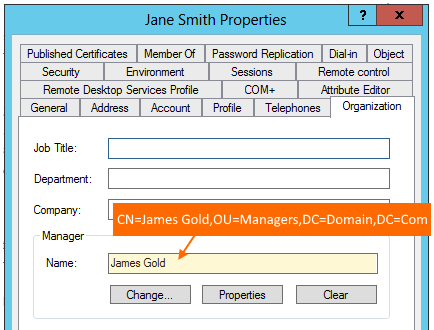 Internally in Active Directory a users Manager (seen on the Organization tab) is stored using the managers distinguishedName, although you are shown the managers cn value. With AD Bulk Users version 5.0.7.9 and later the program can *search Active Directory for the manager’s distinguishedName if your provide the managers sAMAccountName (username of the manger) or the manager’s employeeID value. Below are three example CSV files that would set a users manager value. *Using the sAMAccountName or employeeID will be slower than using the distinguishedName as the program will need to query Active Directory for the managers distinguishedName value.